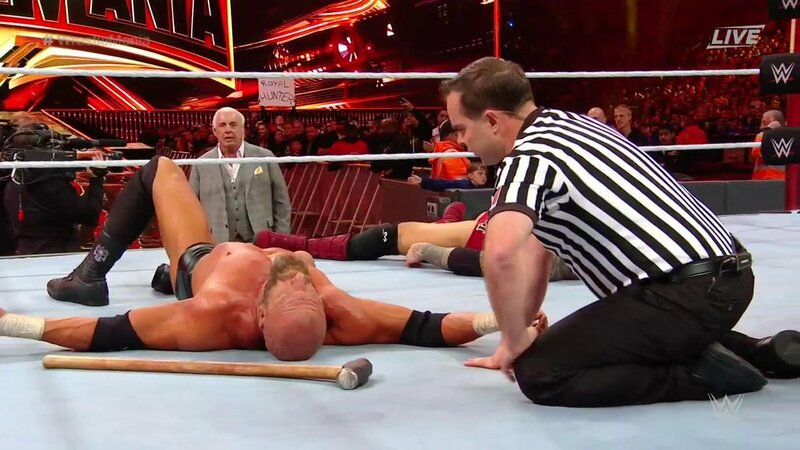 WrestleMania 35: Triple H Vs. Batista No Holds Barred Match - Wrestling Inc.
We go to the ring and WWE Hall of Famer Shawn Michaels is out as a guest commentator for this match. A black SUV pulls up on the stage as a team of security guards in all black line the ramp. Batista exits and makes his way down the ramp as the pyro goes off. Batista enters the ring and slips while entering the ring. Batista then goes to ringside for a staredown with Michaels. A video starts playing on the big screen with a Mad Max/Fast & Furious theme to it. One of the custom cars drives out onto the stage. A man is driving the hot rod and Triple H is perched on the back, wearing a hoodie and a mask. There's a large skull on the front of the hot rod. It revs up some and then stops at ringside. Triple H's music starts up as he stares Batista down from the back of the car. Triple H hits the apron and poses as fireworks go off in the stadium.